After the success of the 2018 season, Apico Factory Racing will move into a second year sponsoring the Apico BSMA National Championship. The BSMA have managed to deliver some fantastic racing in 2018 at some amazing tracks and 2019 looks to be no exception. Tracks included in the 2019 calendar are Landrake, Wroxton and Hawkstone Park. The BSMA has a rich history in the development of riders and grassroots racing which is another important factor to Apico Factory Racing in supporting and nurturing young talent progressing through their riding careers. Dylan Brown: “2018 has been a great experience for Apico in developing a relationship with a fantastic team of people at the BSMA. As a non-profit organisation, they totally give back to the sport in everything that they do. From the volunteer’s at race meetings through to the Directors that dedicate their time to a sport they all love. It’s this passion and commitment shown by the BSMA which convinces me that Apico is making the right decision to partner with the organisation”. Anna Eriksson: “It’s been a great year with lots of exposure from trackside banners and social media promotion through to televised racing on Sky Sports at all the rounds. Our Apico brand is very visible at the events and professionalism showed by the organisers and their teams is a credit to the BSMA. I’m proud to be associated with a grassroots organisation that does such a fantastic job on a national level”. 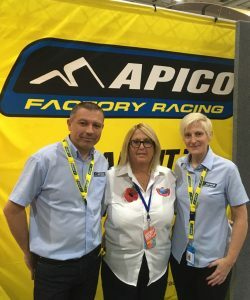 Tracey O’Connor: “We’re happy to have Apico Factory Racing on board for a second year as title sponsor for our national series. Everything promised has been delivered and then some. This year ran smoothly from the start of the season, which is refreshing as there are usually a lot of changes in having a new series sponsor. The riders seem to love the holeshot structure provided by Apico and the prizes that come with it! We’re very happy to be partnered once again with one of the largest off-road distributors in the UK for 2019”.